189 p., 18,1 x 25,4 cm. This volume contains those parts of the correspondence with the theologian Johann Baptist Stoppani, the grammar school teacher Gregor Zeithammer and the Swiss philosopher Johann Peter Romang which have survived. 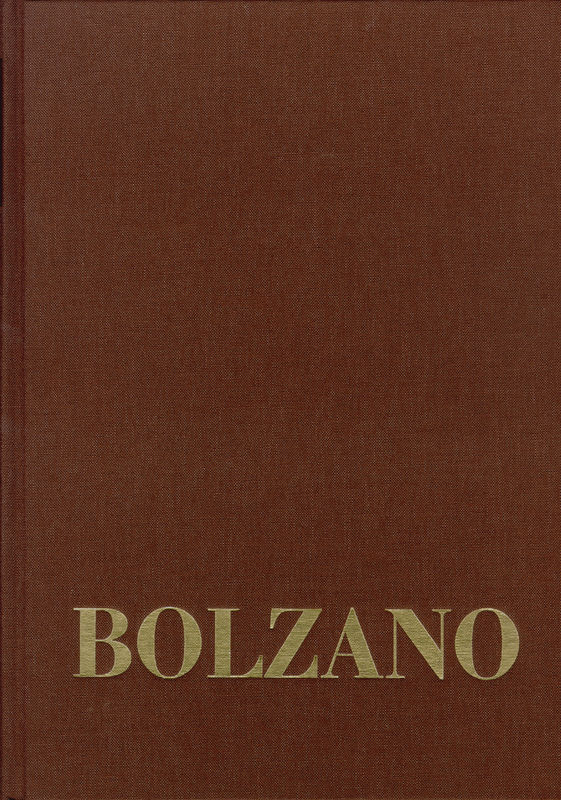 The correspondence between Bolzano and Stoppani are part of a more comprehensive correspondence on the perfectibility of Catholicism. For Bolzano, this correspondence signified the possibility of clarifying and supplementing many terms and arguments from his ›Lehrbuch der Religionswissenschaft‹ (Textbook of the Science of Religion). Bolzano‘s letters to Zeithammer contain valuable references to the fate of his various writings. Bolzano‘s correspondence with Romang contains his instructions for a summary of the most important sections of the ›Wissenschaftslehre‹ (Theory of Science), in which the most important paragraphs with the fundamental terms are highlighted. Mit erfreulicher Geschwindigkeit wächst eines der großen Editionsprojekte unserer Zeit.